Sixty years after first being shown in cinemas, Karel Zeman’s time-travel adventure movie Journey to the Beginning of Time is set to grace cinema screens again. The film, along with a number of other of the director’s iconic works, has been fully restored through a collaborative effort. There are few films that have had such an impact on multiple generations of Czech children as the Journey to the Beginning of Time. Despite being made in 1955, when digital effects were still a term for the distant future, the film managed to recreate pre-historic worlds in a unique, enticing atmosphere, while also combining educational value with adventure. 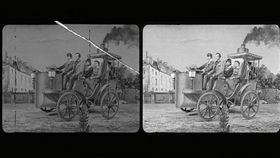 Journey to the Beginning of Time, photo: Archives of TV Barrandov The film’s story revolves around four teenage boys who take a rowboat along a "river of time". As they continue paddling they are gradually taken further back into the past, from the Quaternary and Mesozoic, all the way to the Silurian era, when multi-cellular life first started emerging on land. Throughout their journey they run into famous ancient beasts such as mammoths, sabretooth cats, dinosaurs and trilobites. Often they are forced to make desperate escapes from wild animals back onto their boat, while carefully noting down their descent into prehistory based on the fauna and flora they encounter. 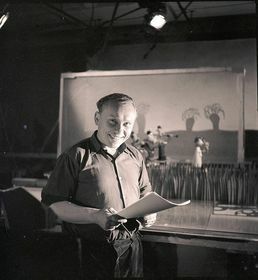 The film was the brainchild of director Karel Zeman, a master of special effects and animation. 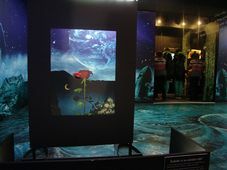 He once said that while making the film he had to hold his directorial instincts back to provide space for a scientific narrative, while also keeping the art realistic. Yet somehow this line between realism and adventure was perfectly blended together. 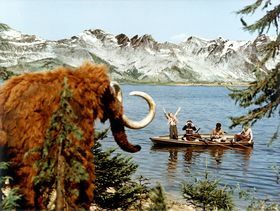 It offered viewers a version of living and breathing prehistoric life decades before worldwide hits such as Jurassic Park and Walking with Dinosaurs took to the screens. 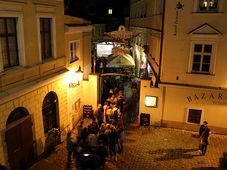 The director’s daughter, Ludmila Zemanová, an accomplished artist herself, told Czech Radio that she gained a whole new appreciation of his input in the film while writing a book about his work years later. 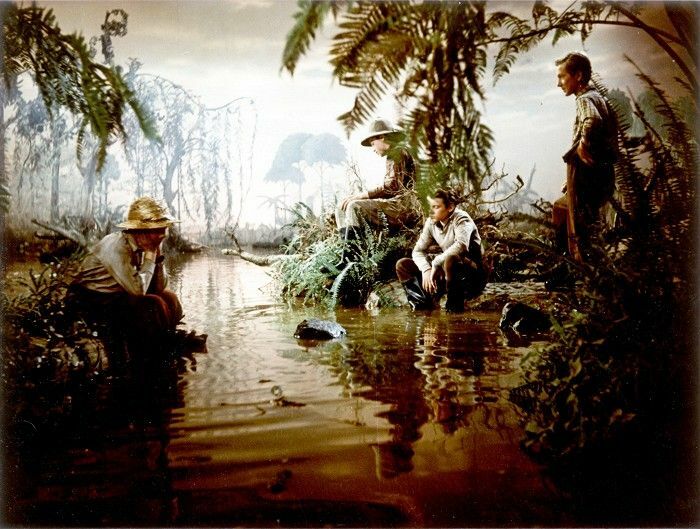 Journey to the Beginning of Time, photo: Archives of Karel Zeman's Museum “Because I was also writing a book on my father at the time, I suddenly realised how deeply each aspect was thought out. There is an excellent idea behind all of it. That it also had the desired effect can be seen in the case of Josef Pšenička, a palaeontologist at the Museum of West Bohemia, whose fascination for ancient species was first kindled through a childhood viewing. “I was in my fourth class at elementary school and my sister was tasked with taking care of me because my parents were away for the day. A few days earlier I had seen the film Journey to the Beginning of Time and it made a massive impression on me of course. The movie quickly became very popular and would go on to win awards at international film festivals in Venice and Mannheim. Furthermore, Karel Zeman’s work left a lasting impression on many famous directors including Steven Spielberg and Tim Burton. Karel Zeman, photo: Archives of Karel Zeman's Museum The late Vladimir Bejval, who played one of the four boys, told Radio Prague that studies of the Czechoslovak director’s sets were used in film schools. “When the brontosaurus or dinosaur came from here to here, it took him six hours. It was a piece of art and until now in the United States and Canada they show this movie to students and say, this is a piece of art." 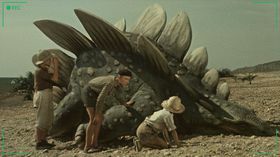 Aside from recreating prehistoric beasts and landscapes, Karel Zeman, who is also often dubbed the Czech Méliès, managed to make the science-fiction books of Julies Verne come alive. Movies such as The Stolen Airship and Invention for Destruction were both based on the works of the French author and Mr. Zeman made sure to keep the visual art of the films close to the original illustrations in Verne’s books. Many of them create the impression of a moving set of Victorian line engravings. This unique artistic signature, as well as the international renown of many of his works, has made it easier to restore the director’s films, says Ondřej Beránek from the Karel Zeman Museum, which took part in the restoration project together with the foundation Nadace české bijáky and Czech Television. “We fully restored Invention for Destruction, The Fabulous Baron Munchausen and Journey to the Beginning of Time. Precisely because we have restored these films, there is a great interest in them again. “It is standard practice worldwide to restore films before they are shown again at festivals and on TV screens. It was not an easy process. Restorers first wanted to find the original film negative that they could use, but could not find it anywhere. This led them to search for alternative copies. Just as they were about to start their work however, the original appeared out of the blue, says Ivo Marák, executive producer of post-production studio UPP, which was in charge of the restoration. Now, after years of restoration work, the title is finally headed into cinemas again. The public premier will take place on the April 25 and a Blu-Ray version is also available for purchase.